HOW IT ALL STARTED: For some unexplained reason I had a serious interest in all things electrical, unexplained because neither my parents, my brother nor any other relatives had this interest. As a school kid I had a special interest in old radios and my neighbors used to give me their old broken radios for parts. Sometimes I would simply replace the tube that didn't light, the radio would play and my neighbors thought I was a genius. 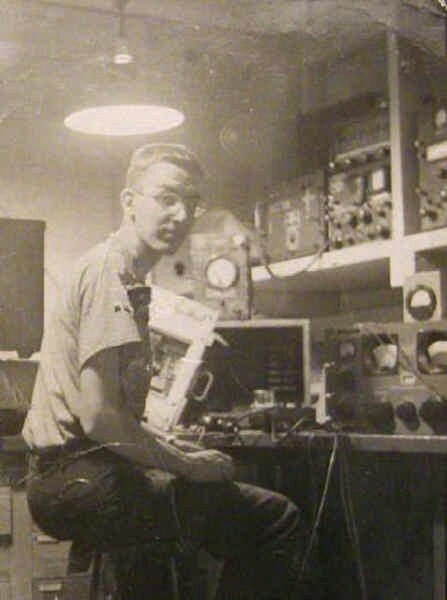 One afternoon in 1956 I was tuning one of those old mahogony console radios with the green eye tuning tube and I heard this guy in a casual conversation as if he were right beside me in the basement. His chair was squeaking and I heard his wife come down their basement stairs. I got nervous. I called my dad to come down to our basement and listen as I thought I was evesdropping on something I shouldn't be hearing. After a few minutes my dad said he thought it was ham radio. My interest was peaked. 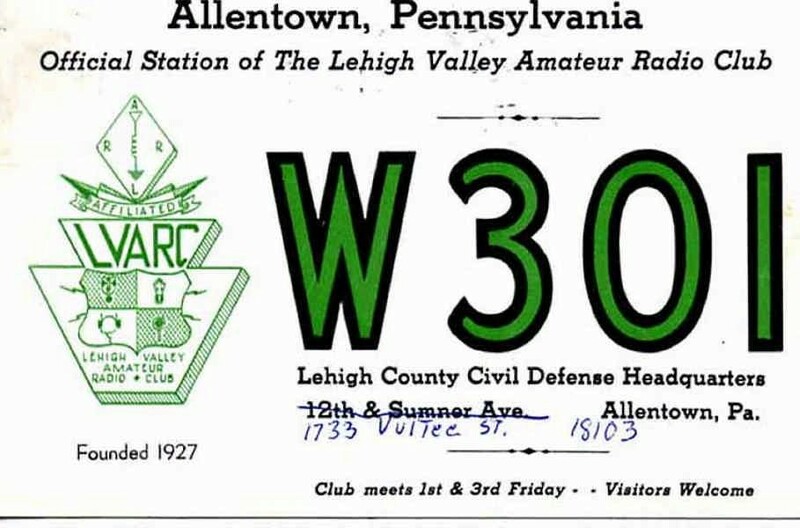 A week later my dad saw an ad in the local Evening Chronical Newspaper placed by the Lehigh Valley Amateur Radio Club (LVARC). 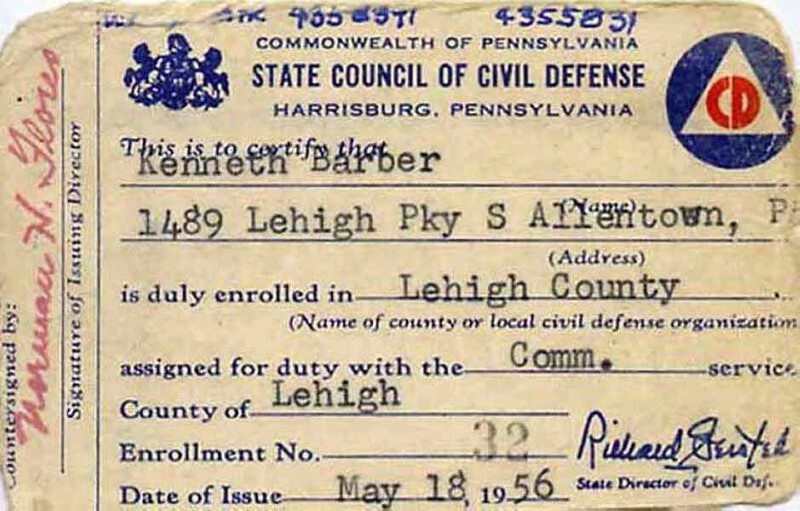 The club said it was starting Amateur Radio code and theory classes at the Civil Defense building on Sumner Ave. in Allentown, Pa. 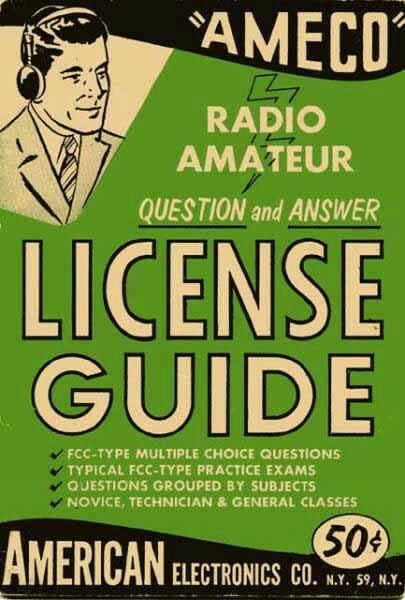 I jumped in with both feet, I studied hard and with the help of the LVARC radio guys I was able to obtain my Amateur Radio License. 1: 1950's. Civil Defense had nationwide awareness and while I was working toward my amateur radio license I joined CD for Radio Communications duty at the radio club in Allentown, Pa.
2-4: Shown are several of my 1955-56 radio study books. 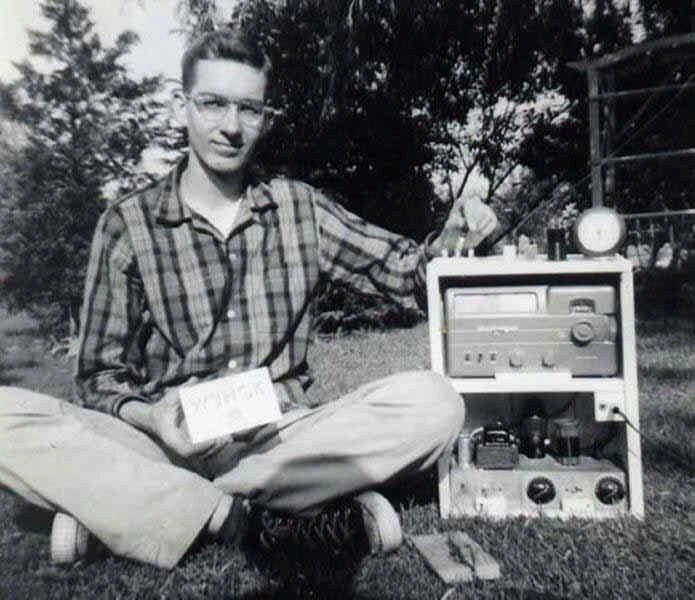 5: Henry Mohr, W3NCX, was my "elmer" in the late 50's. 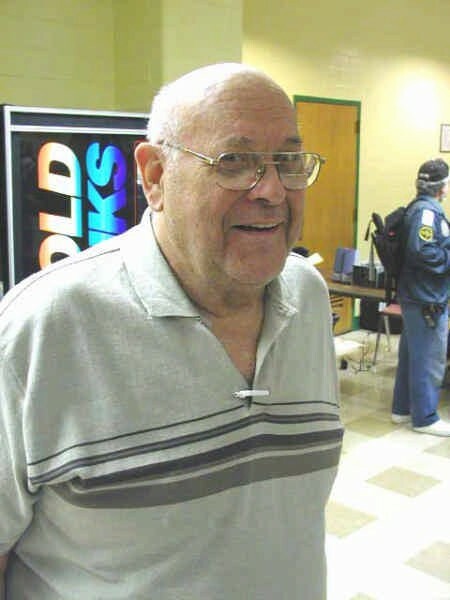 He lived just a short bicycle ride from my house in Allentown, Pa. Henry was very patient with the 16 year old kid and he taught me a lot about amateur radio. 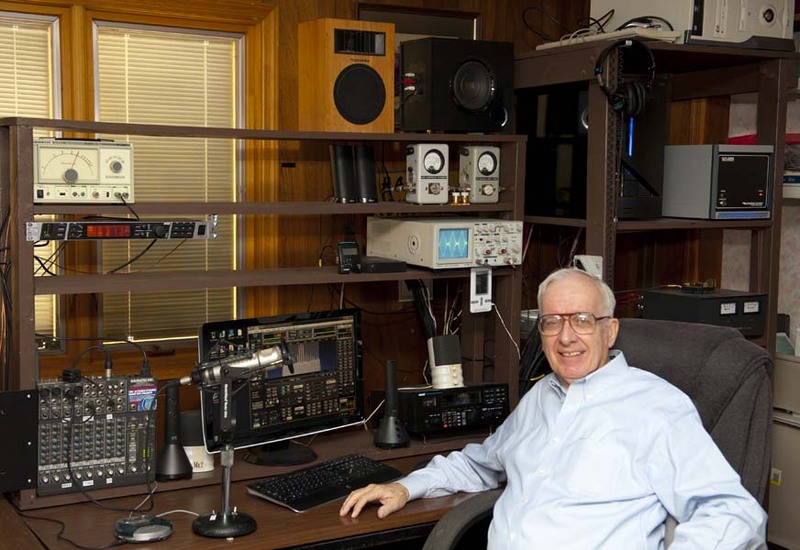 Henry could fix any radio with just a volt-ohm-milliammeter. 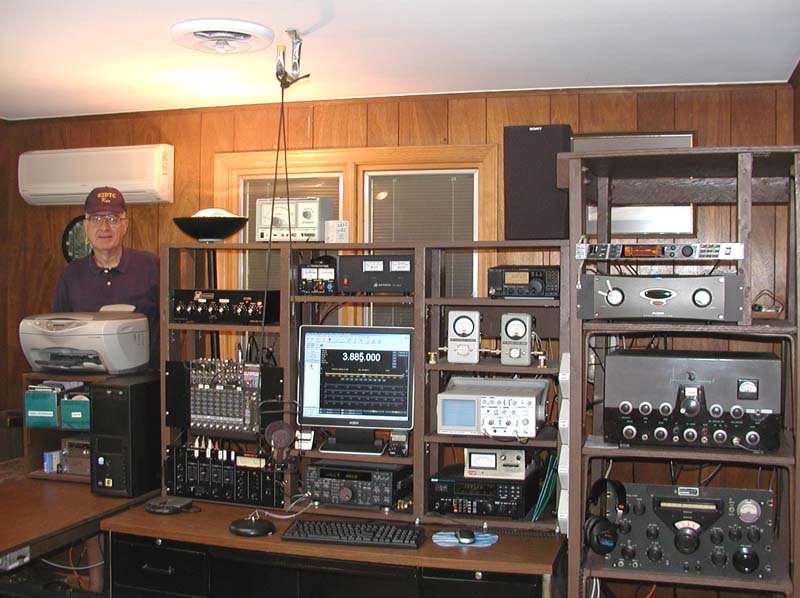 (Photo of Henry at age 82, still going strong at the Cherryville Hamfest 2002 near Clinton, NJ). 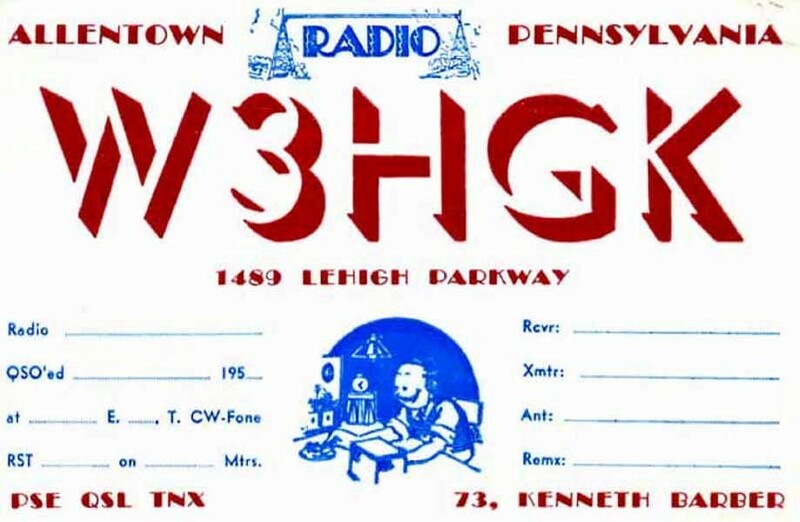 6: Treasured QSL card from a 1970 QSO with the Lehigh Valley Amateur Radio Club. 7: June 1956. 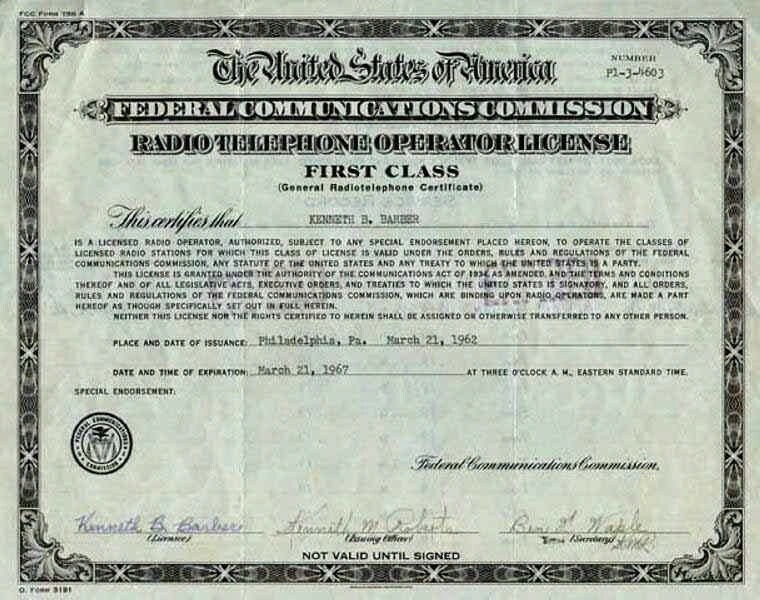 16 years old and my first FCC Amateur Radio License as Novice Class WN3HGK in Allentown, Pa. 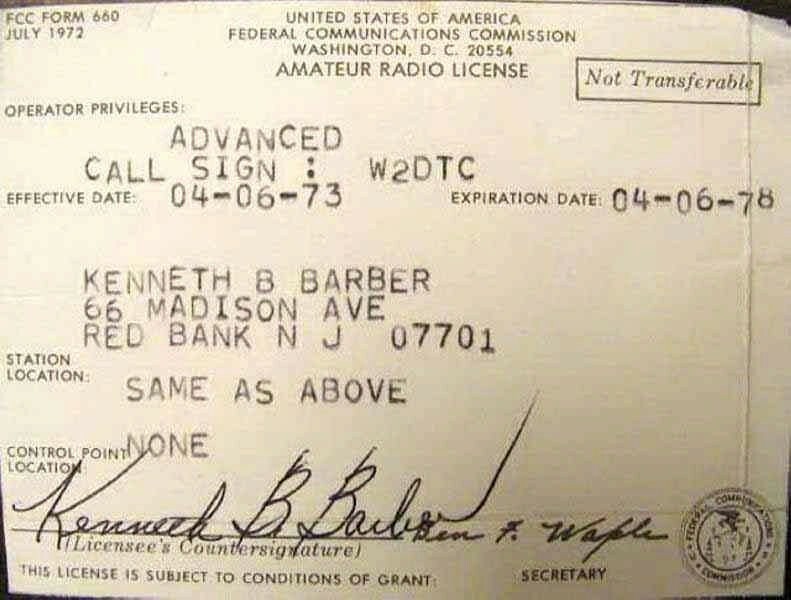 In those days FCC license processing was done manually and I checked my mailbox everyday for about six weeks until the license arrived. Holding that license in my hand was a thrilling moment I will always remember. 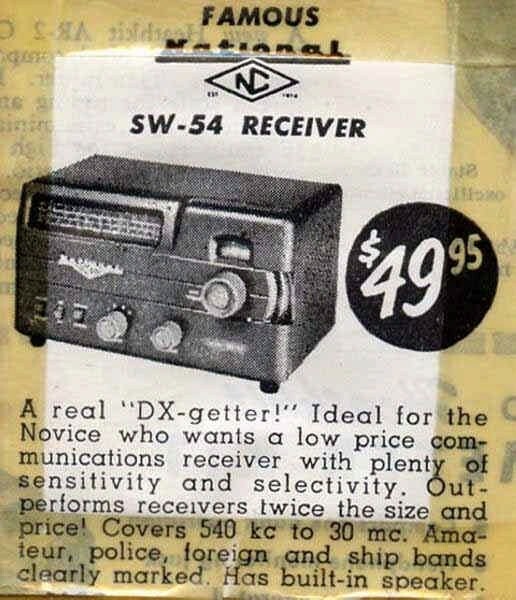 8-10: My first Amateur Radio Station and the magazine ads showing the price and the specifications. 11-13. The Philmore Transmitter. 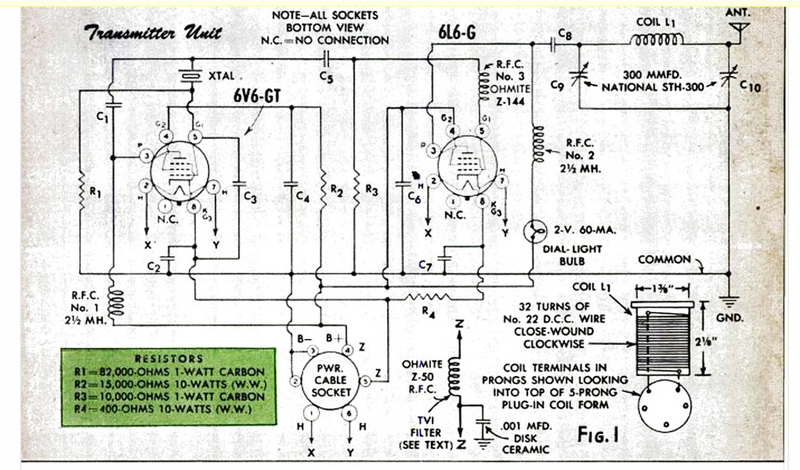 I don't have the original schematic, but I came across this schematic in a 1951 Popular Mechanics magazine. It looks to me like the exact schematic of the old Philmore. 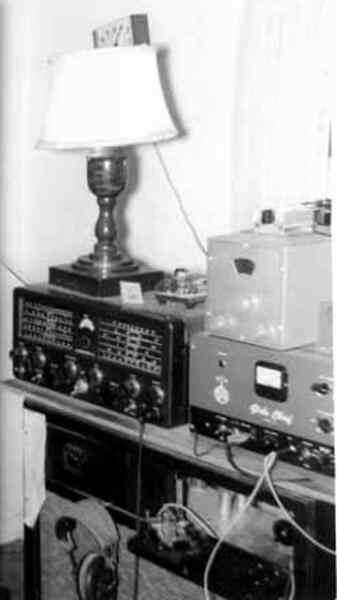 *(For those who wish more information about the Philmore Transmitter, please see comments by Lee, W0VT at the bottom of this webpage). 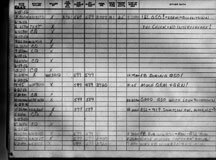 15: My first log book and QSO. 16: December 1956. Upgraded license to General Class. 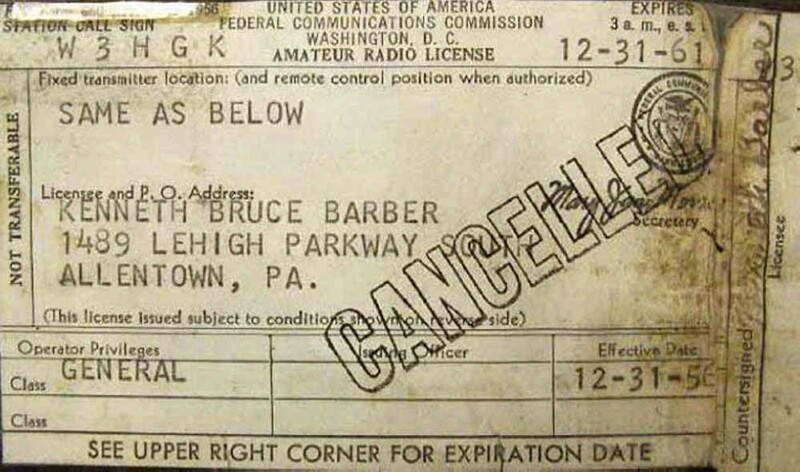 (Upon renewal the FCC would send back the old one with large "CANCELLED" letters). 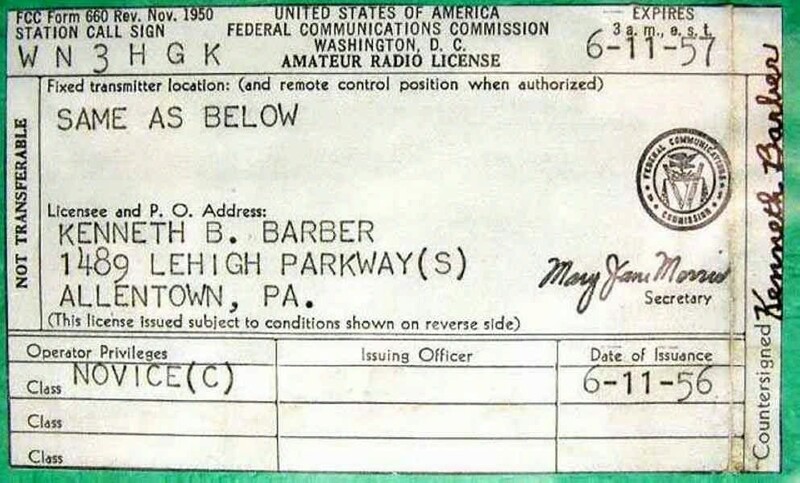 17: QSL card for the General Class License change. 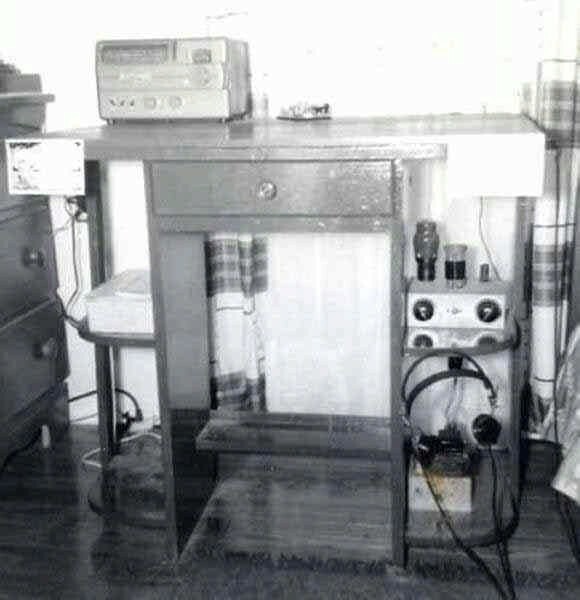 18: June 1957 my second station: Hallicrafters SX-71 Receiver and 7-9.1 MHZ BC-459 transmitter. 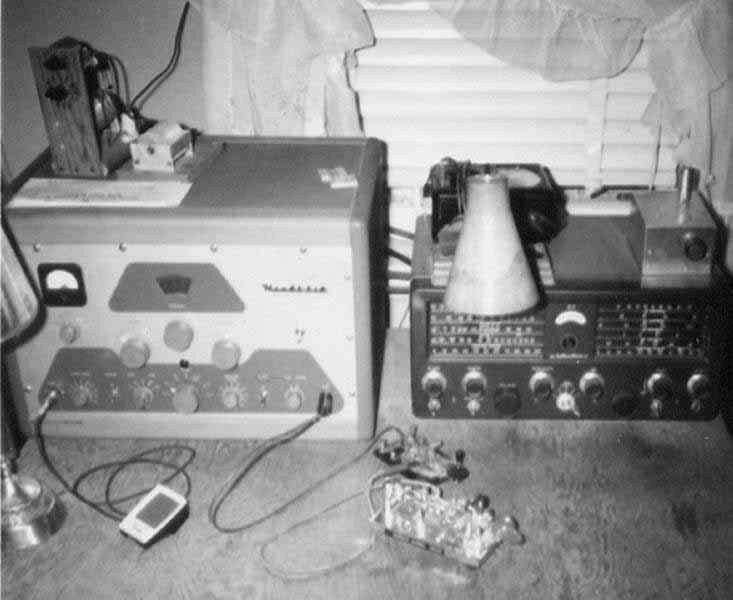 19: July 1957, I repackaged my first rig as a backyard portable station. 20: July 1957. 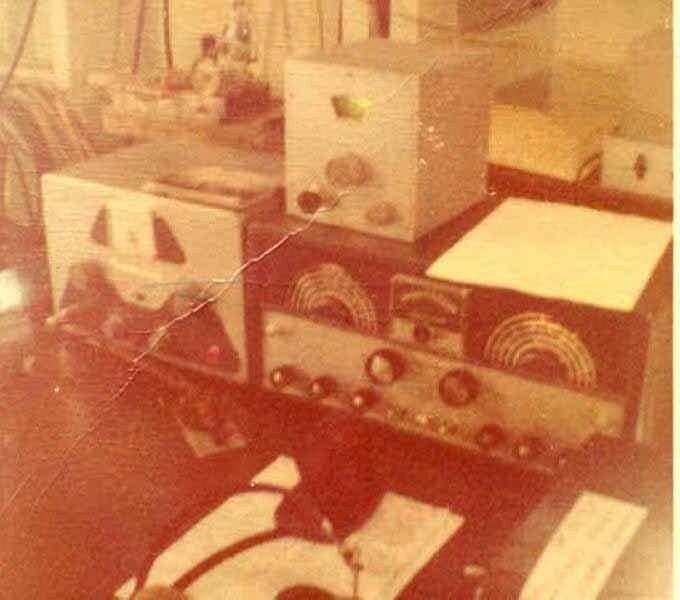 MY first AM station, a WRL Globe Chief transmitter and Heathkit VF-1 VFO. An external screen modulator, barely visible inside the desk, was added to get on AM phone. 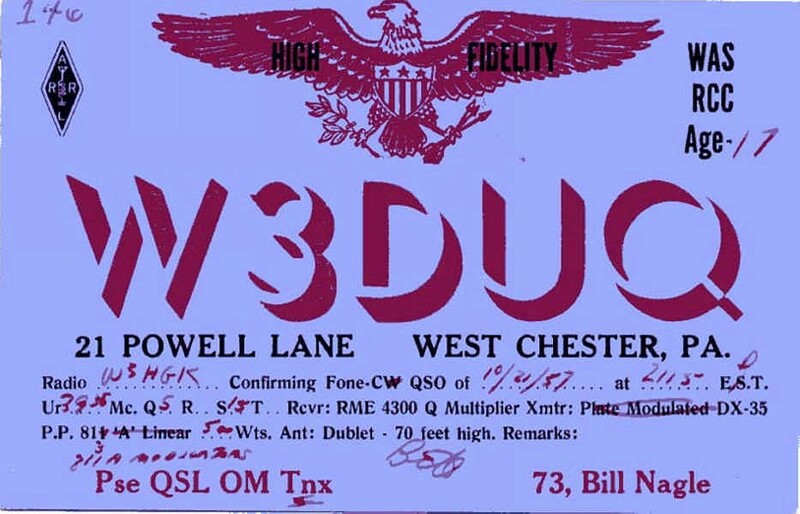 21: 1957 QSL card from my friend Bill, W3DUQ, who is still on HI-FI AM in 2009. 22-23: September 1958. Added a homebrew pair of 813's in push pull Class "C" with Barker and Williamson kilowatt plug-in coils. The driver was my old WRL Globe Chief and Heathkit VF-1 VFO. For use on AM, I turned off the external screen modulator on my Globe Chief and grid modulated the 813's with output from a tape recorder into a reverse filament transformer. I got reports of weak modulation relative to my carrier but, I was on AM. 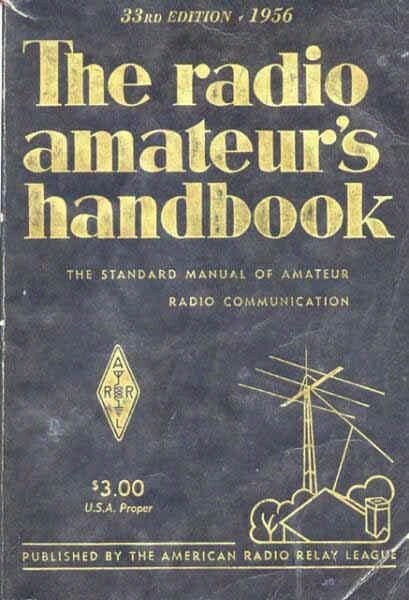 24: 1959-1961. 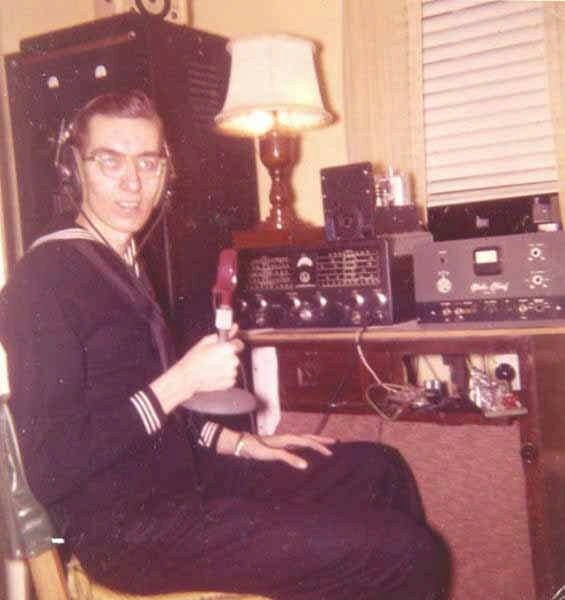 My enjoyable experiences with Amateur Radio led me to my Navy recruiter, where I asked if I could go to electronics school. The Navy said YES and after basic training, the Navy sent me to the Great Lakes Naval Training Center in Illinois where I did indeed get 32 weeks of very interesting and top-notch electronics training. After completing electronics school I worked as a Navy Electronic Technician (ET) in the Ground Electronics Shop in Guantanamo Bay Cuba. 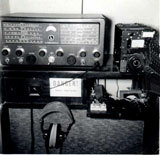 (Notice the SP-600 receiver on the bench). 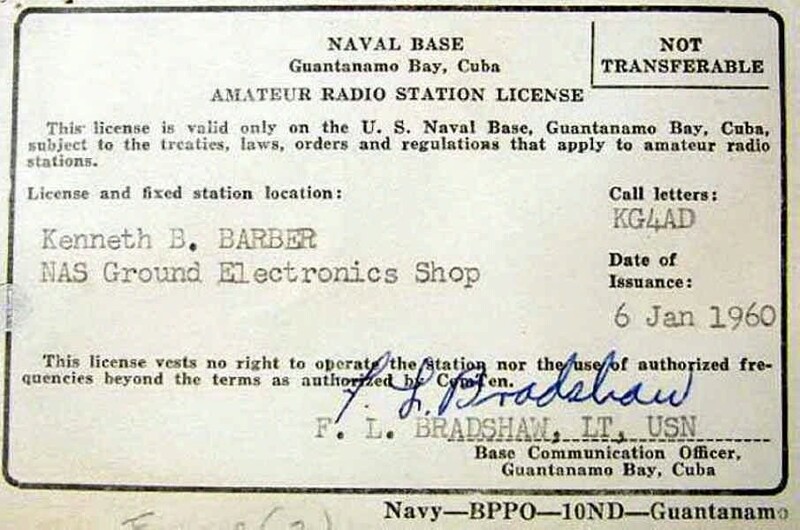 25: In January of 1960 I received my KG4AD Amateur Radio license from the Base Communications Officer in Guantanamo Bay Cuba to operate at the Naval Air Station (NAS) Ground Electronics Shop. 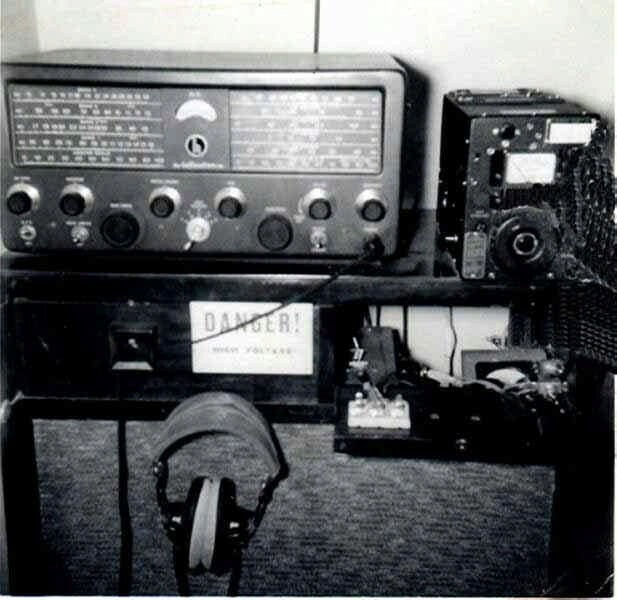 26: My Guantanamo Bay (GTMO) ham station: Heathkit DX-40 Transmitter with Heathkit VF-1 vfo and a Hallicrafters SX-99 Receiver. Operated CW on 80 and 40 meters and phone on 10 meters. 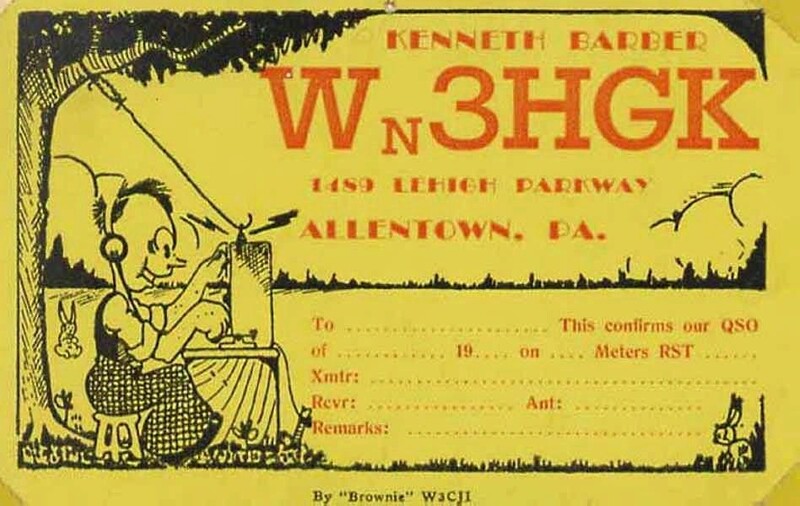 Antenna was a 360 foot long wire favoring the east coast of the USA on 10 meters. 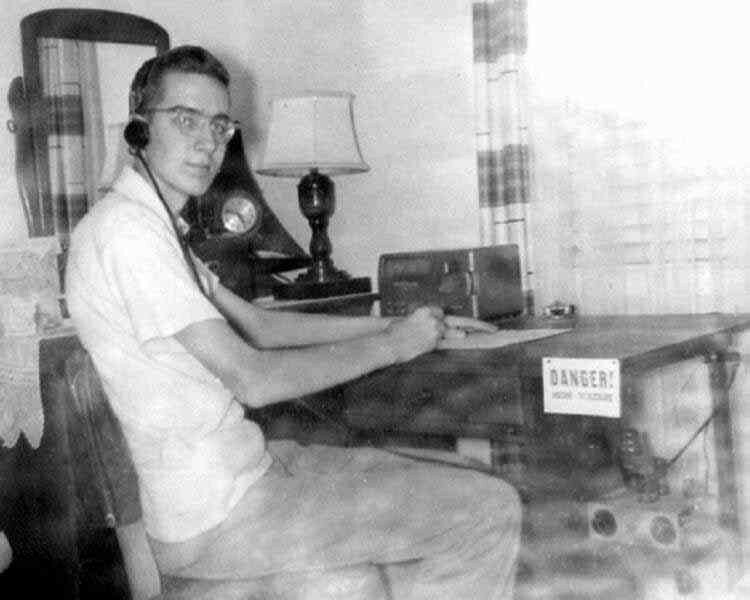 It's important to mention Charles A. Milson W3AFE of West Catasauqua, Pa. who met me on the air each day at noon so that I and many Navy men could speak with their parents via phone patch. 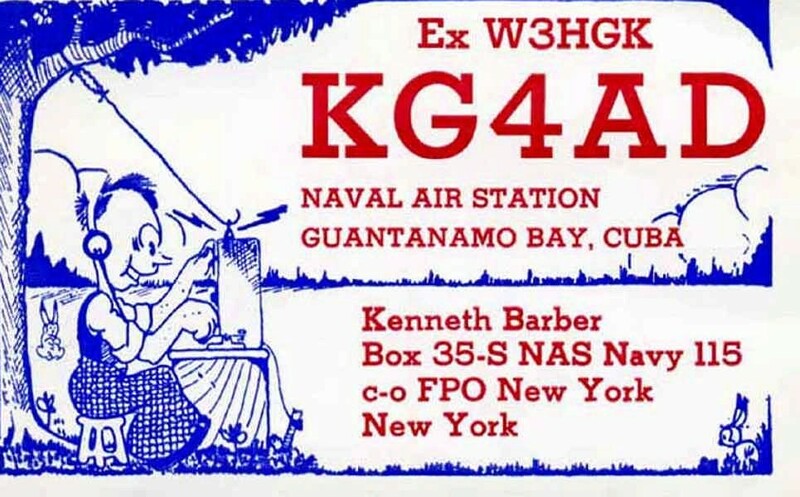 27: QSL card for my station KG4AD. 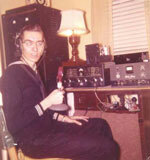 28: A photo of me on military leave to my home in Allentown, PA operating 75 meter AM phone with my homebrew screen modulator on the Globe Chief. 29: August 1961. 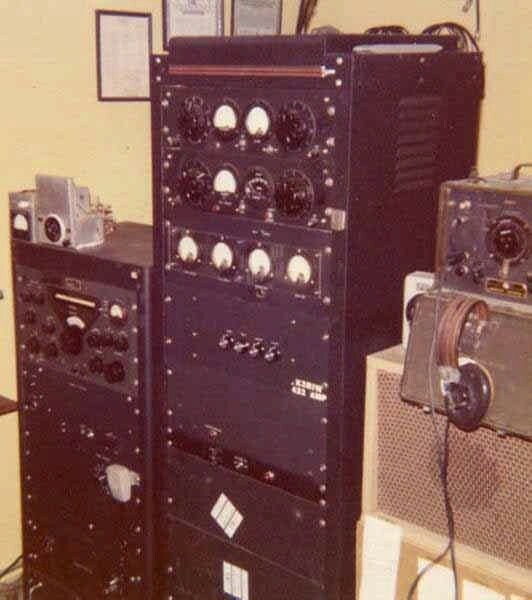 Back to civilian life in Allentown, Pennsylvania with a much better sounding AM Phone station: Heathkit DX-100 Transmitter, Hallicrafters SX-71 Receiver. 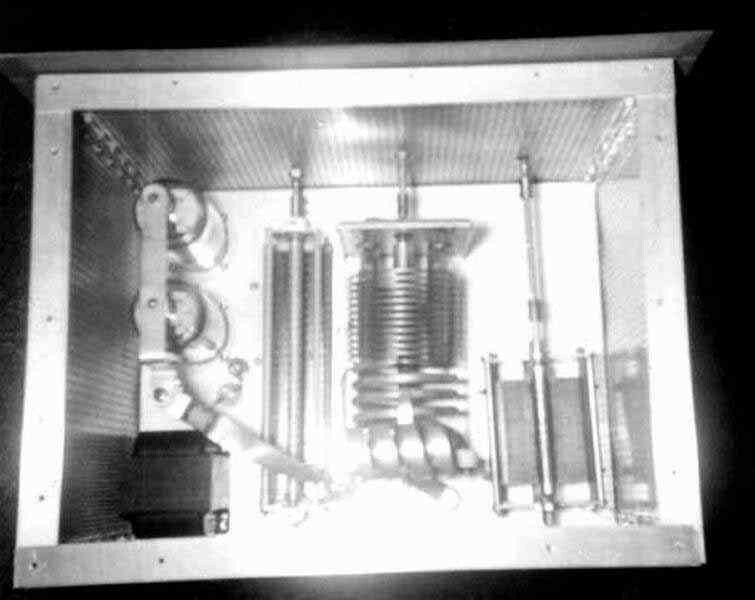 30-31: October 1961, I finished building my next amplifier with a pair of 813's in Class "B" parallel with a Barker and Williamson 850 bandswitching coil assembly. 32: March 1962. 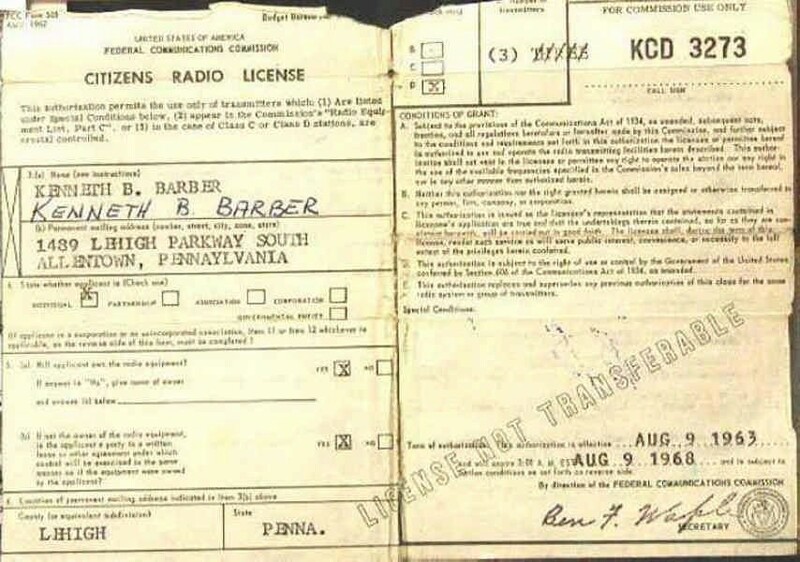 Passed my First Class Radio Telephone Operator License and in June 1962 got a transmitter engineering job at WAEB Radio in Allentown, Pa. WAEB had a directional 1000 watt AM transmitter at 790 kHz and a 5000 Watt FM transmitter on 104.1 mHz. 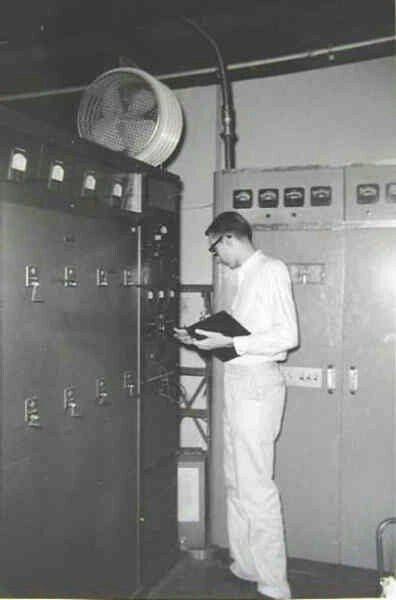 Since the transmitters rarely needed maintenance, I was able to do my college studies at the transmitter building. 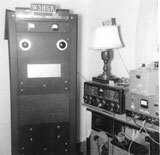 33: As engineer, I took common point readings on the WAEB AM transmitter. 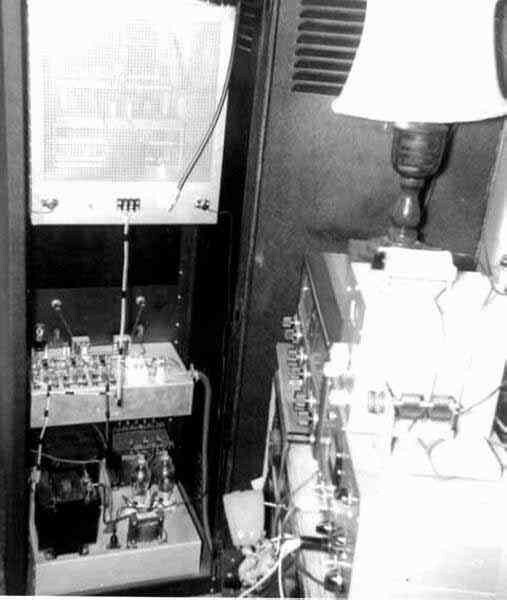 At the left is a 50KW phaser (overkill for a 1KW transmitter) which was used to provide power to the five WAEB towers. To my right was the 5 KW FM transmitter. 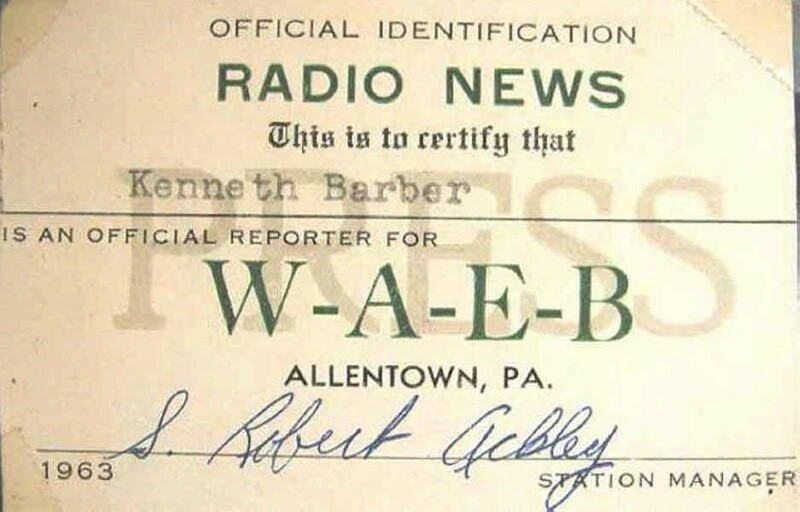 34: The WAEB station manager gave the engineers a Radio News ID card, just in case we saw something worth reporting. 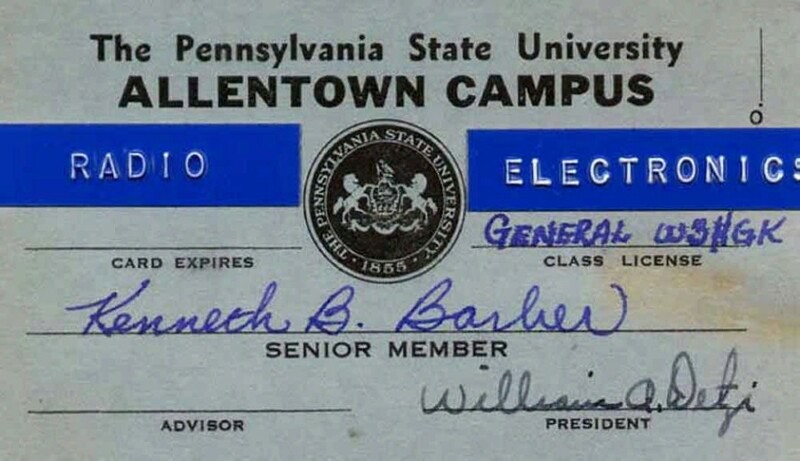 35: My Penn State Electronics Club ID card. Click HERE to read about my seeing BALL LIGHTNING at the radio station. 36: I met a die-hard CB'er in college and got a CB license to join him on the air. 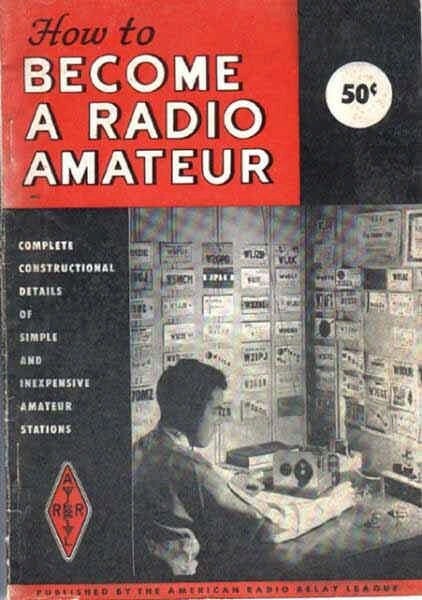 In the early sixties there was little CB activity and everyone used call letters. 37: March 1967. 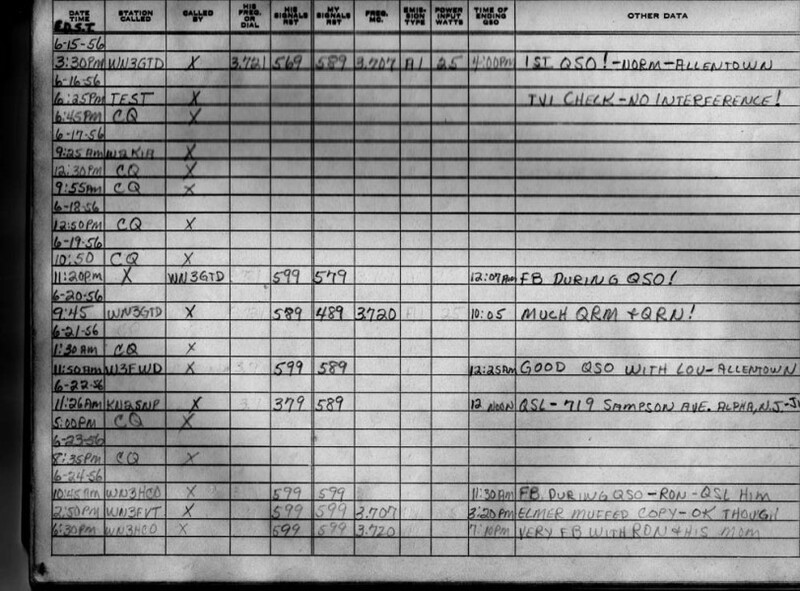 During the sixties my job moved me around the country and in the sixties it was proper in the FCC environment to change call letters to match the call zone in which you lived, thus in 1966 I was W8ICA in Iron Mountain, Michigan (copy of license not found) and in 1967 I was W9KGF in Wheaton, Ill and in 1969 I became W2DTC in Red Bank, NJ. 38: April 1973. Upgraded license to Advanced Class. 39: January 1975. Upgraded license to Extra Class. 40: 1975. 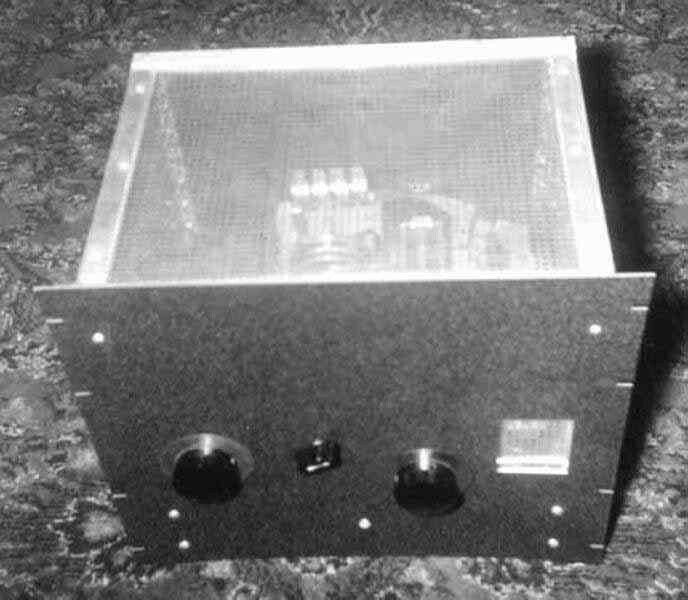 Having been on fast scan Amateur Television (ATV) since 1969 I finally built a high power, narrow bandwidth, black and white video transmitter. It was a pair of 4CX250's which put out 625 watts of peak sync video. 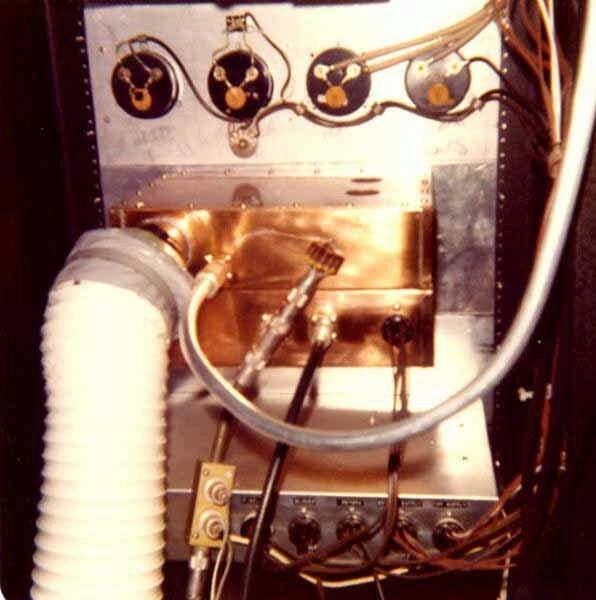 This photo shows the back view of the all copper UHF amp based on the K2RIW design. 41: The packaged ATV rig in the black crackle rack. 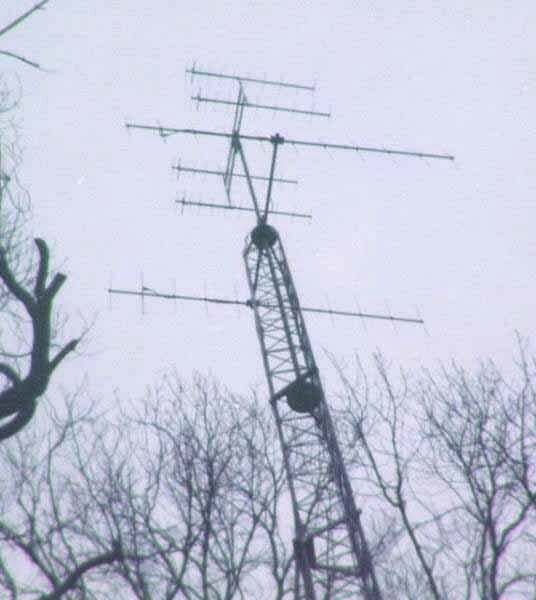 42: My 88 element ATV array (also a K2RIW design) and my 26 element 2 meter array (Cush Craft). 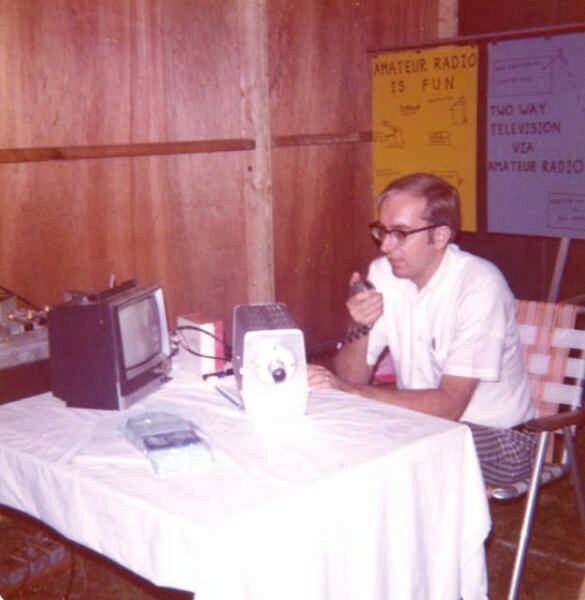 43: Advertising ham radio and ATV, I'm manning a booth at a local fair in NJ, giving the public a live amateur television demonstration. 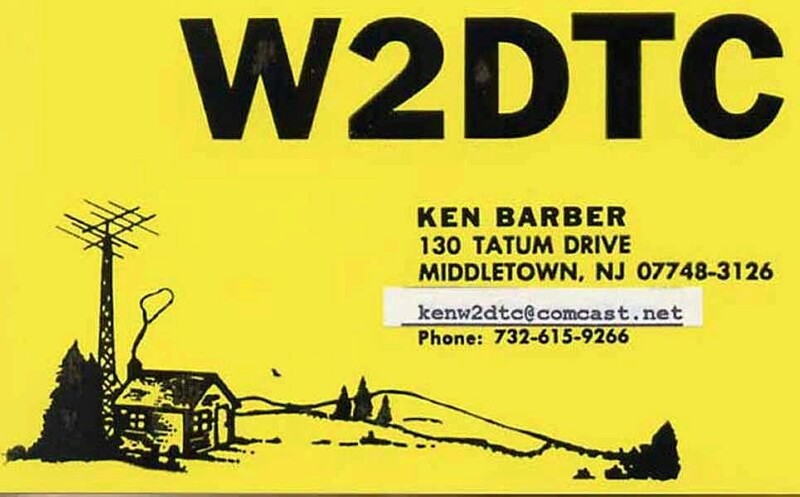 44: My QSL card up to the year 2010. 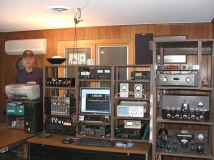 45: My Vintage AM station up to the year 2010. 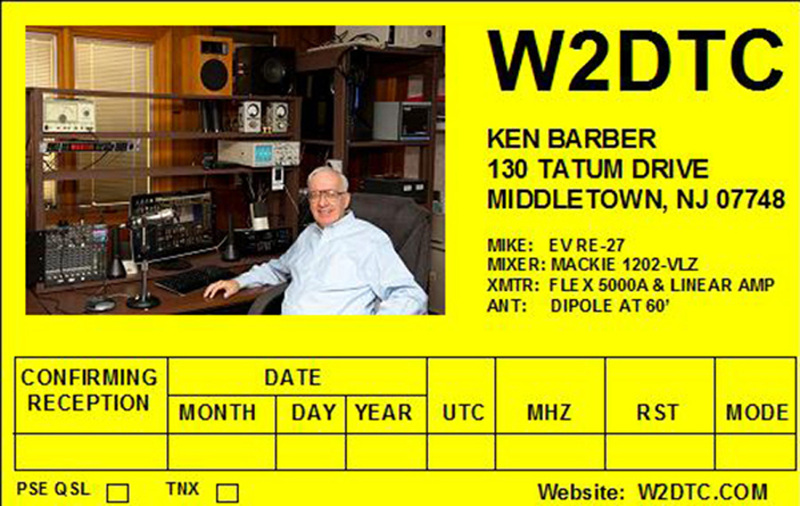 46: My current QSL card generated on my computer. 47: My current flex station starting in September 2010 to present. I am active on 160-75-40 AM. I still do a little SSB but to date, 95% of my air time has been via Amplitude Modulation. 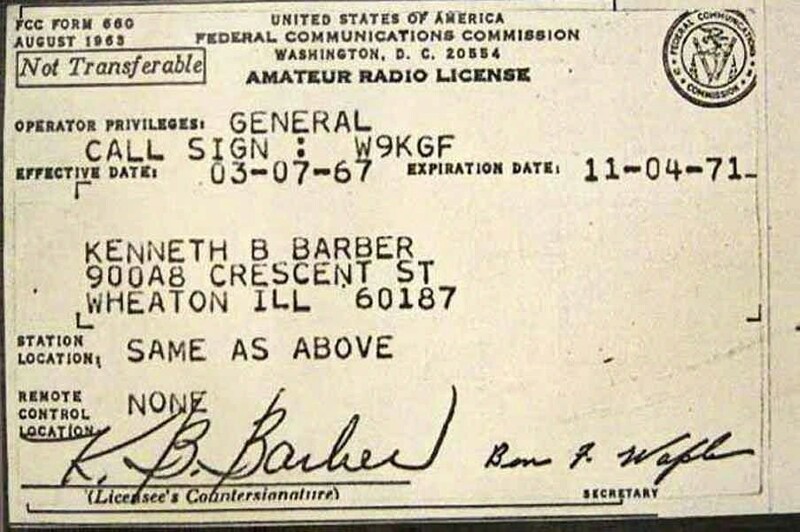 I was licensed in 1953 as WN9DRC. 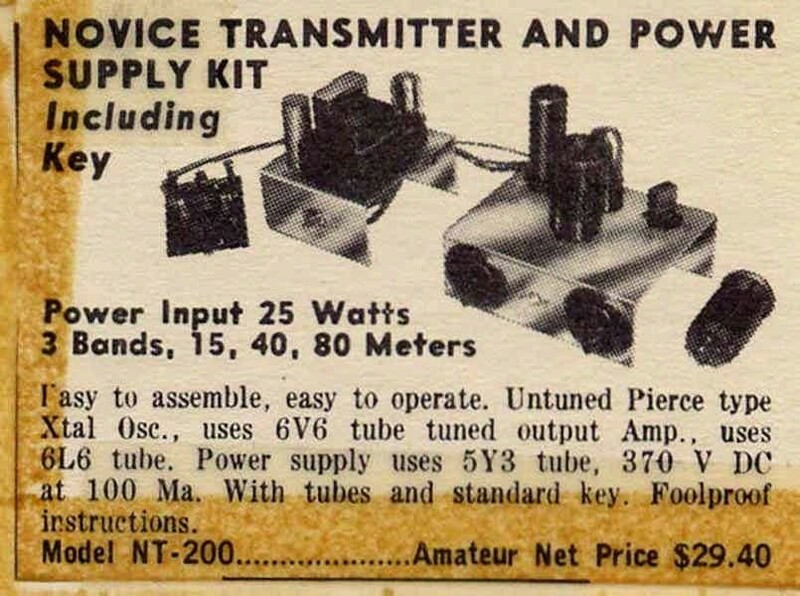 I bought a close out transmitter from Burstein-Applebee which was almost identical to the NT-200 in size shape and circuit. 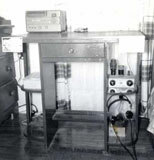 It was first designed and sold by Gross Radio Company in New York City. 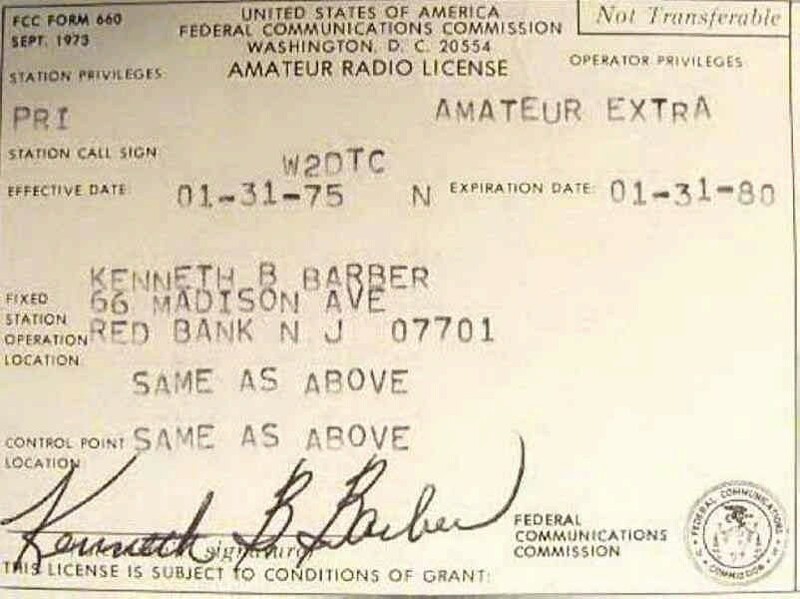 They called it their EAGLE transmitter. (They also had a receiver called an EAGLE receiver.) My friend WN9DXS purchased a Philmore NT-200 at the same time. Yes the circuits were almost identical. However the EAGLE had an 80 rectifier which is an older 4 pin version of the newer 8 pin octal socket 5Y3 rectifier. (Your schematic shows this 80 rectifier and not the 5Y3 as used in the NT-200.) My EAGLE also had a neon lamp bulb for tuning installed in the bayonet socket rather then an incandescent lamp. Burstein-Applebee must have bought the remaining EAGLES up and sold them kind of surplus for less money then the Philmore. The Gross Eagle had a lot of surplus resistors and capacitors from the late 30s in it. Those called out variables in your diagram look like what was in the EAGLE. (The Philmore used two 100 uuF variables and not broadcast band variables.) I still have one of the two Eagles I once purchased but I have lost the manual sheets. The big thing was the parts were almost identical. From all this, I think Philmore kind of grabbed the design once Gross Radio dropped it or went out of business. (They were an old time radio parts store in NY City which started up I think in the 1920s.) I have since built up a Philmore NT-200 clone with a few minor improvements. There are a lot og guys super interested in the Ameco AC-1 and build clones of the real one. I really don't understand why there is not more interest in NT-200 clones as it is a much better transmitter.